We wake up to another beautiful day in Italy. The sun is out and the mountains are aglow. We can see the water of the sea shimmering in the sun light. As most days, we start at Isola Verde for breakfast and our portion of high-test coffee. We sit like the Italians, relaxing and watching those around us. We can see bathers on the beach and waking on the sidewalk in front of us. We connect to WiFi and connect to family and friends. Some may question technology in such a beautiful place but we have a need to stay connected to those we love and miss. The week is half over but we don’t want to think about that just yet. We plan our day. Thinking about the small and large cities around us. Which should we visit today. 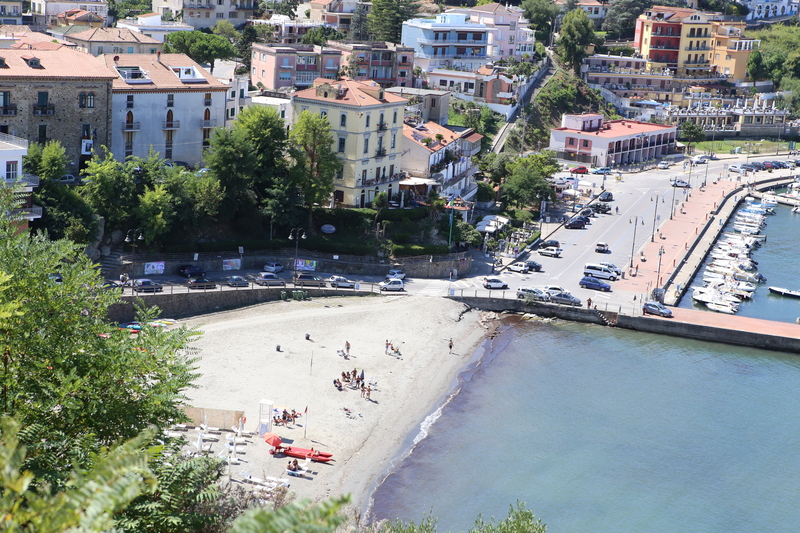 Agropoli is the largest city nearby. Our bank is located there. We have been there but not to the old city. 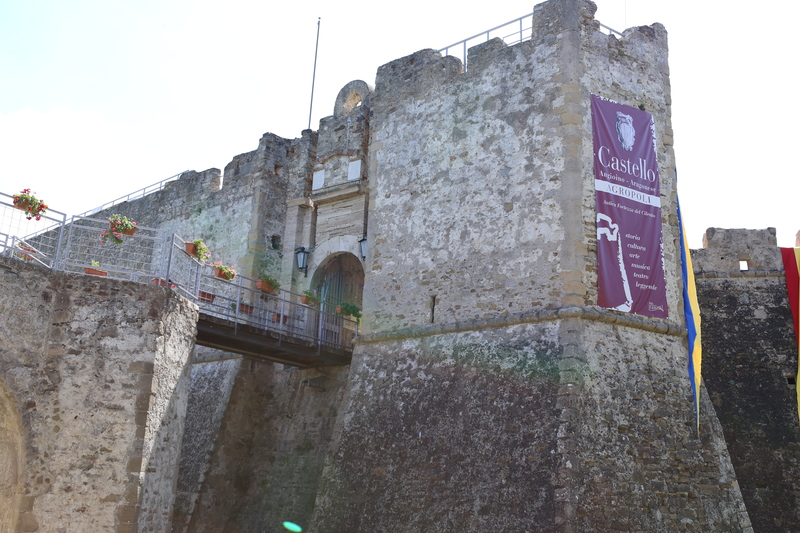 We have read about an old church and the castle. We decide to make our day trip there. The Drive on the highway is easy until we get to the part that was destroyed by the rain. We are diverted off onto a mountain road. It takes about 10 minutes longer. 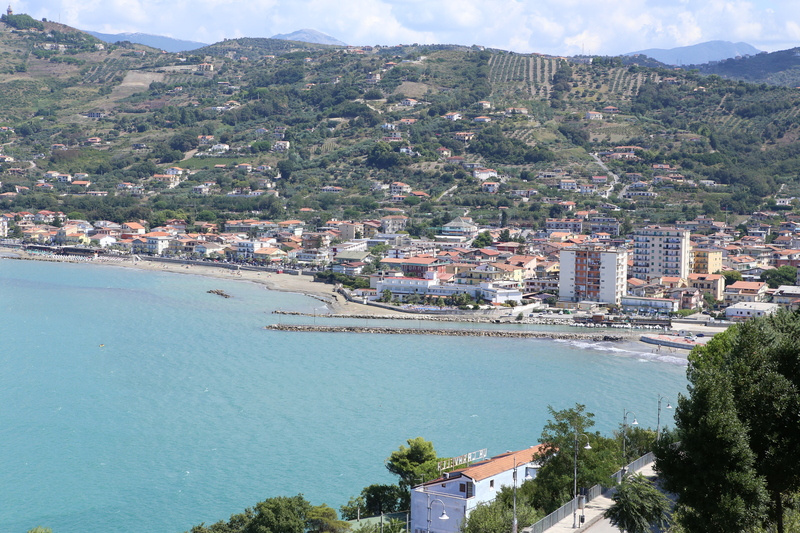 We arrive in Agropoli and you need your GPS turned on. We use Tom Tom Western Europe on our iPhones. The streets are narrow with lots of twists and turns. The city is large and you can easily get lost. Finally we arrive in the old town area and look for parking. George finds spaces near the marina at the foot of old town. You buy a ticket (biglietto) at a machine for so many hours of parking. We can not see the ticket machine anywhere. George asks some people nearby and they don’t know. They ask others and finally we discover the machine is about a 1/4 mile away. After getting our ticket and displaying it in the car window, we head up the steep streets toward old town. These streets are lined with shops that we browse. After awhile the street (pedestrian only) is so steep it just turns into a set of steps. You are rewarded for the climb by seeing a beautiful old church and a castle at the top of the hill. 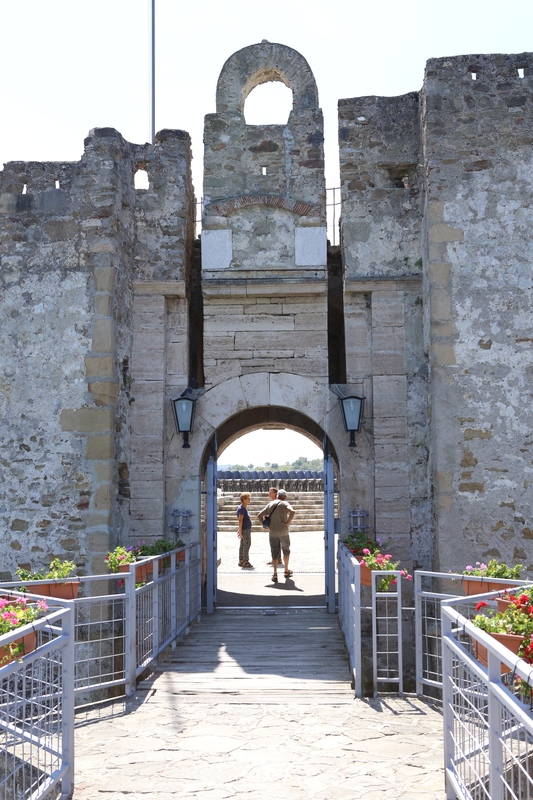 It has a moat (which is now grassed and serves as a parking lot and delivery entrance. From the castle are magnificent views of the harbor far below. That evening we had our first guests to our house. We had some prosecco and then went to dinner together. Dinner was wonderful! We ate at a restaurant called Mama Angelina’s in Marina Casal Velino. It was on the street by the beach. We had a seafood dinner. Plates just kept coming. More fish and more fish. Finally we had to say BASTA (enough)! The food, wine and company were delightful. Later we sat on our deck and watched the starry night. The sky is alive with stars here. We don’t want to go to bed because we might miss something spectacular. Tomorrow is another day … we will discuss Thursday in paradise tomorrow.